1. Did you see this man? Oxidised copper, pigment, p.v.a., thorn, bluebottle. I was lucky enough to be invited to make a piece for the Engedi Arts festival last Easter. 30 different artists were invited to submit a proposal in response to a given theme. I was allocated ‘Christ and doubting Thomas’. Surprisingly, we were not necessarily encouraged to respond to the theme in an overtly religious way. I was relieved. I am an artist who questions the nature and existence of the human soul. I might be pretentious (as all art is*) but hopefully, I’m not hypocritical. I chose to look at the circumstances of how Thomas received his news of Jesus’ resurrection – he was only disciple for whom proof came verbally, rather than visually. This sculpture – the first of a series of five – shows a crown with a single thorn. 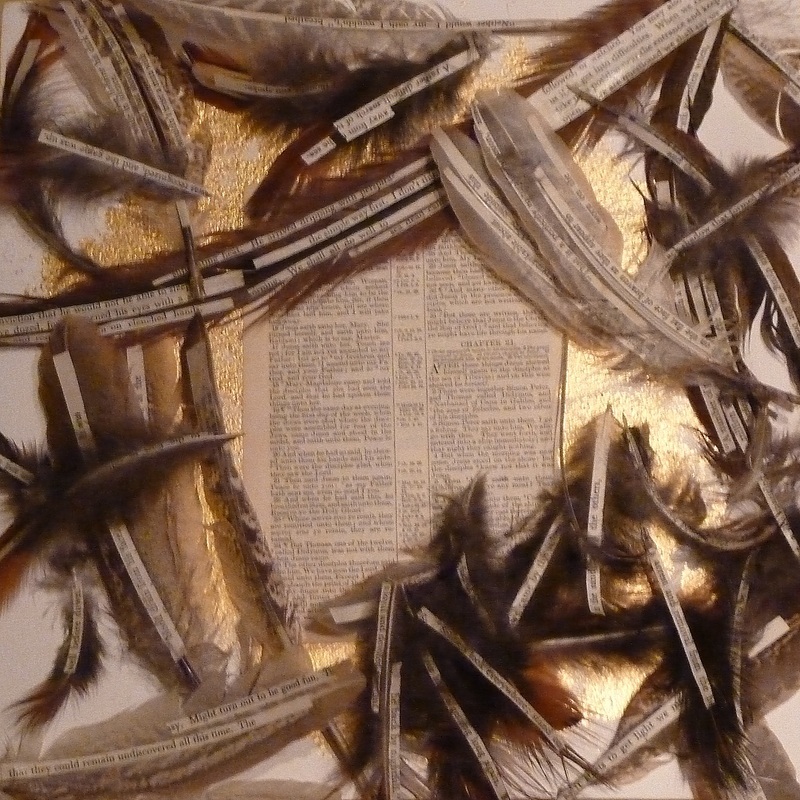 Pheasant feathers, text, gold leaf. This card shows a flurry of words pasted onto feathers – the ephemeral nature of pub talk. They were unrecorded.....lost forever. They surround the words also spoken that night which were written down, and guarded with gold leaf for the next two thousand years. How much of history is never captured? 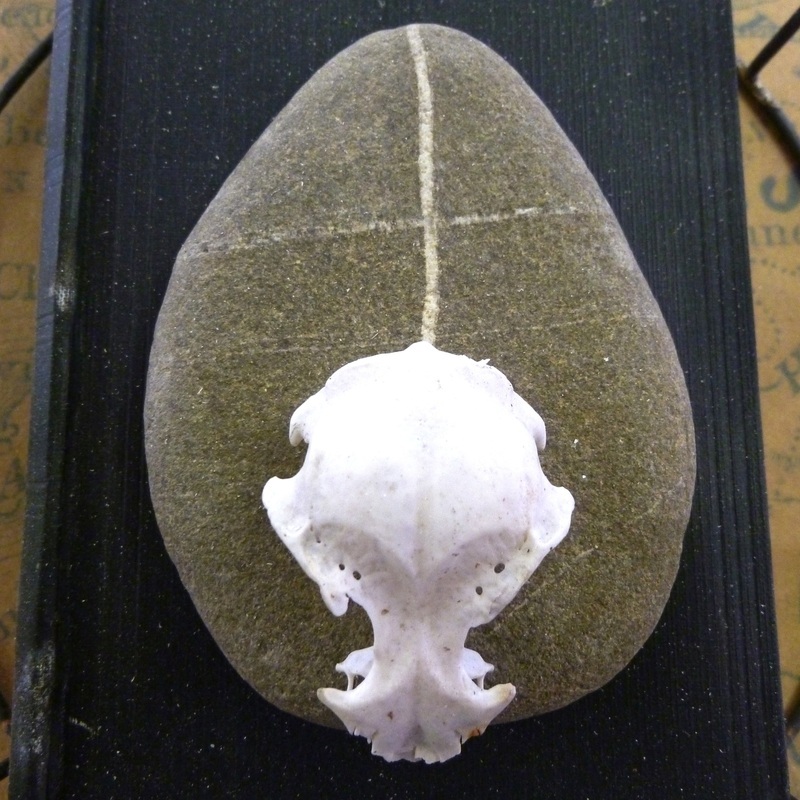 Beach pebble, resin cast of pebble, text. Words, then......how much do they mean? What is their value? Let’s take another biblical phrase ‘cast the first stone’. .It was said to a mob of onlookers, as they surrounded an adulterous woman, ready to stone her to death. Yet they all were guilty of sins - known and unknown. None had the right to condemn. 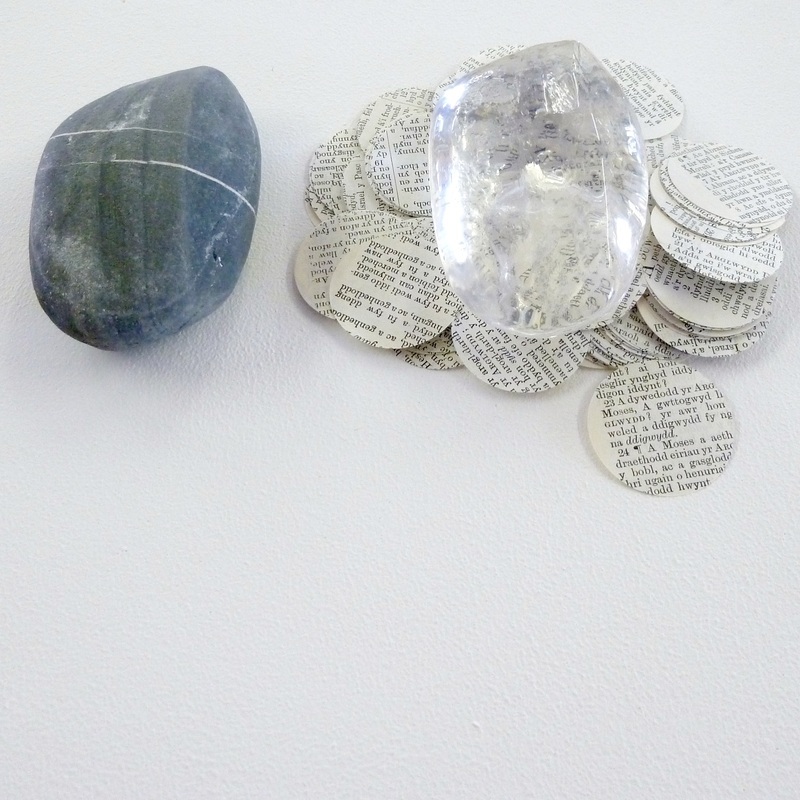 In this sculpture, I have used small snipped circles of paper – cut from my grandfathers’ Welsh bible – to illustrate the way in which our ancestors were fed their morality: a small neat dose every Sunday. There is a sense of containment. No need to relate it to anything bigger. The stone? If you asked me to cast it, I would. I would cast it in glass. Or resin. Or low melt alloy. I am a sculptor..and we all interpret the world according to the way we see it. The price on your head is in part - payment for a promise. 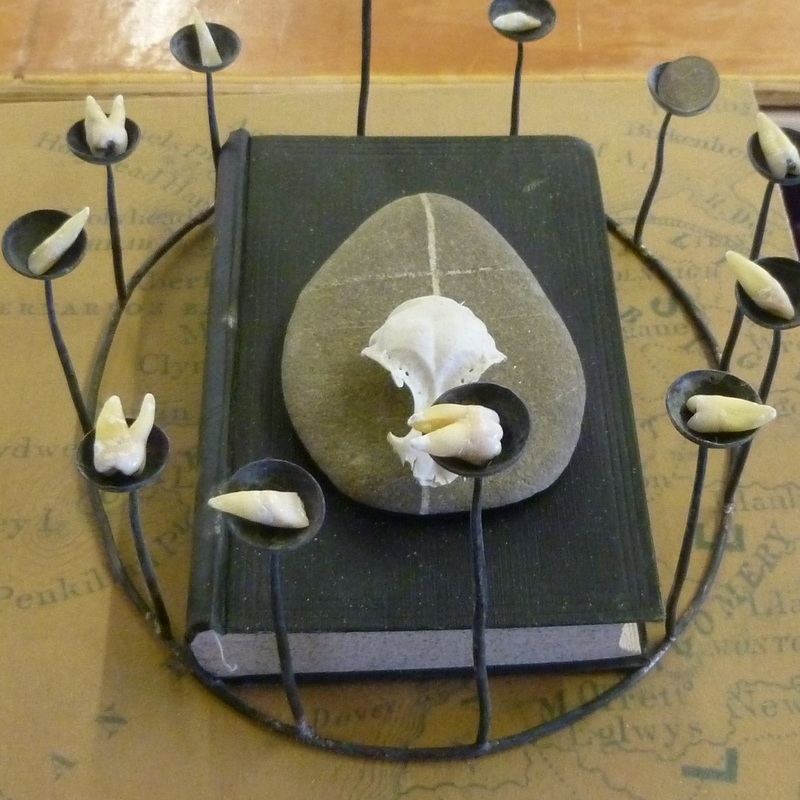 Print, oxidised copper, human teeth, coin, Bible, rabbit skull, pebble from Porth Meudwy. Oxidised copper, pebbles from various locations, gathered at various times. 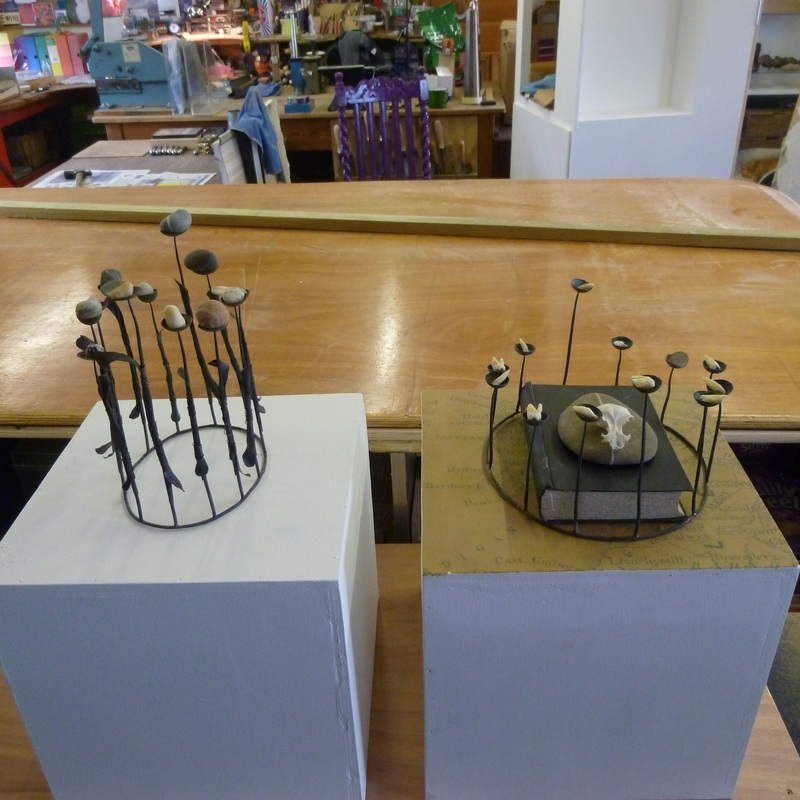 This picture overleaf shows these two sculptures being made and set up here at the blue earthworm, in advance of the Engedi exhibition. Porth Meudwy, on the Lleyn peninsula, is the beach from which pilgrims have set sail to Bardsey Island, off the west coast of Wales for centuries. I used the idea of how religion can get caught up in the fine details – tangible, yet unimportant. In medieval times, it was believed that one pilgrimage to Bardsey (printed on the underlying map) was worth three to Rome – and that the island offered a direct link to heaven. To die there was to be assured of a place among the saints. Indeed, the island is named ‘The Island of 1,000 saints’. 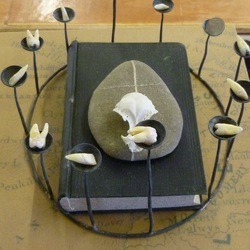 In an era that thrived on pilgrimages and sales of indulgences, relics like teeth, reputedly belonging to saints, passed for great amounts of money between hands. They conferred an exalted status; a blessing. It was almost an organised booking system for one’s place in the great hereafter. The coin is a pre-decimal sixpence. Although it might refer to these payments, it actually represents the money left under my pillow as a child, when I had recently lost a tooth. The child who believes in the tooth fairy actually gets the sixpence. I have neither enough faith, nor cynicism in me to speculate about whether other ‘payments-of-belief’ were well spent. Close up of the fourth sculpture. I went to Bardsey Island myself. Where had once stood a thriving monastery, only a collection of wind-bitten cottages and harsh scrubland remained. A huge unbroken sky that flung torn shreds of cloud, shrieked around me. Yet, falling over me, with the gentle blanketing mist, came a sense of peace. Small streams, gushing and burbling down the side of Bardsey’s single mountain, foam-tumbled and ferny edged, gathered in soft brown gurgling hollows. As they had since before all religion began. The rabbits own the island now. Everything is words, isn’t it? Years ago, I read one of those supposed ‘amusing’ letters in a magazine. A woman had been preparing food for a family feast. One of the items to be prepared was a boiled ham. She filled the pan full of water, salted it, and set it to boil. She took the joint of ham out of the fridge and unwrapped, rinsed it, and re-tied the string. She cut the ‘end’ piece that you discard, off. But she didn’t throw it away. As it cooked, she wondered about this leftover section. Her mother had always cooked ham that way. And her mother had always cooked it that way. Intruiged, she rang her grandmother to ask. What was actually wrong with the bit that you always cut off when you boil a ham? It looked the same as the rest. “Arena of doubt” deals with ideas about how we obtain out beliefs, how fixed they are, and impervious to reason. The crown indicates the head; the ‘arena’ of thought. It is adorned with a ring of spikes, each carrying one of a series of items. They – quite at random – represent ideas or beliefs. Some move easily. Some can only be removed with difficulty, others not at all. And the spikes themselves remove....some are quite loose and will dislodge with little effort and attention. ‘Scones next letter’ simply refers to a handwritten recipe in my possession. My own grandmother wrote it to my mother, when she was a newly-wed back in the early fifties. In it, she enclosed that week’s recipe – Gypsy Creams. I have faithfully followed it to the letter on many occasions, but never had the same results as she did. Close up of the crown from above. Although these crowns are not wearable, I have been working on a series of designs for wedding crowns. The first is due for production this autumn, and will be appearing on the Blue Earthworm website. We’d be happy to discuss any of your wedding plans with you, and can design purely decorative pieces, or ones that tell a little of your life story. If you have small treasured objects you’d like us to include, we will happily make you a bespoke crown. (too much to bear) 2012. 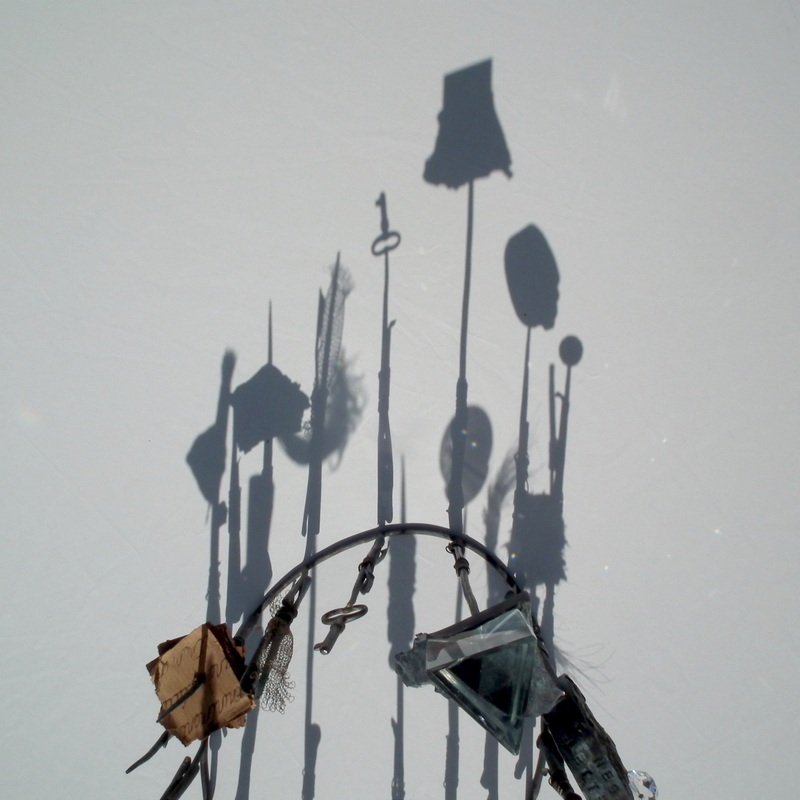 Gilded and oxidised copper, resin, found objects. 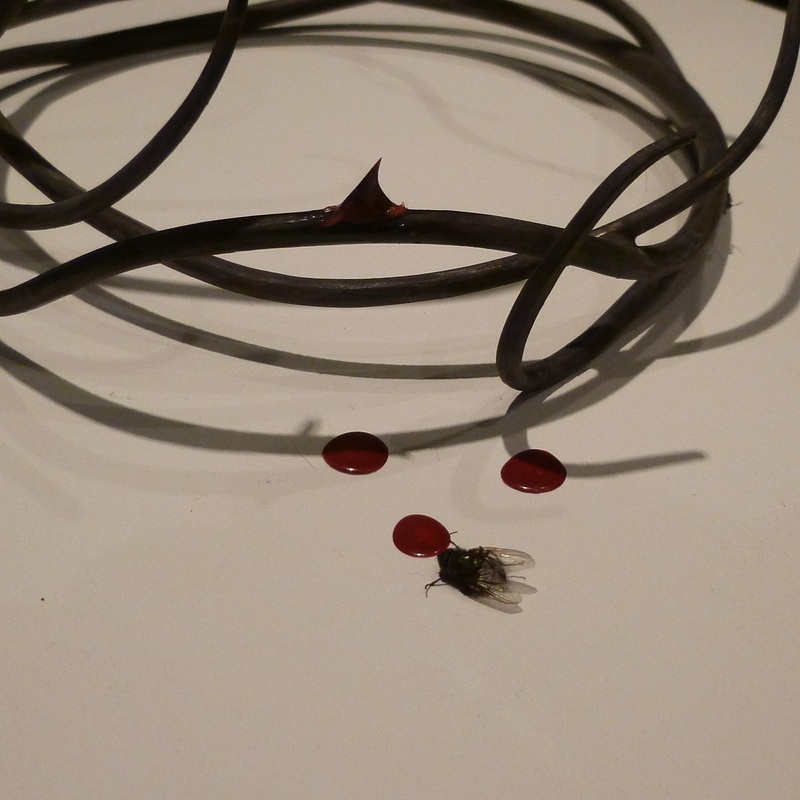 ‘The careful load is a companion piece to ‘Arena of doubt’. 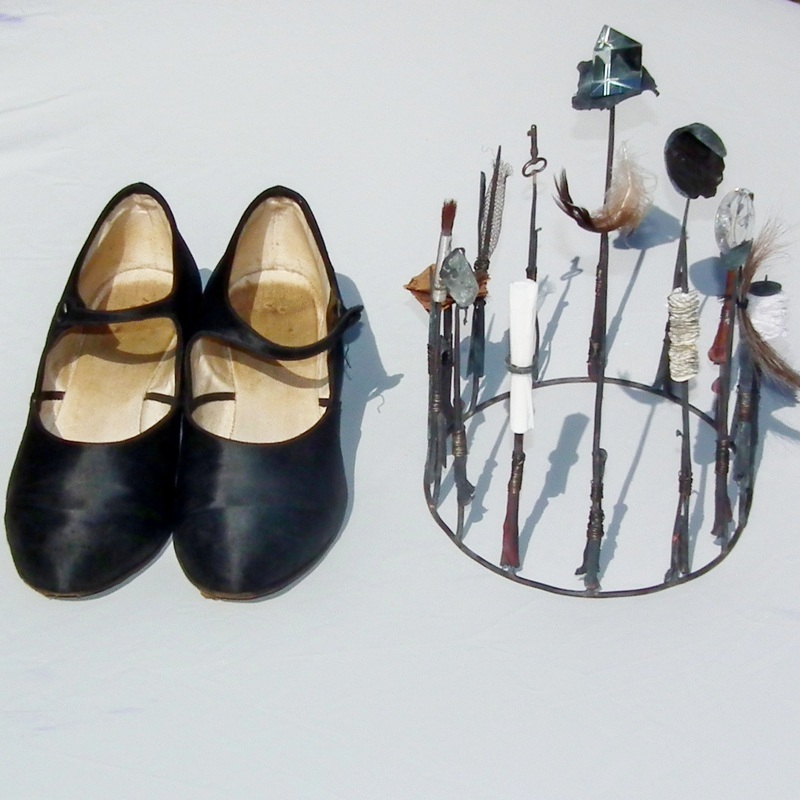 Whilst the second crown, with its 1930’s black satin dancing shoes, represents a woman of the art deco era, ‘The Careful Load’ could be taken to represent her child. Let me ask you something: did you look at the photo overleaf, and think...”she’s not got that crown straight in the photo. It’s wonky”. You’ve looked at it with a sense of expectation as to what an object ‘ought’ to be. Even an object previously unknown to you. And perhaps with no little sense of irritation? The child the object represents will have ideas about her own role and identity handed down to her. By her mother. By her schoolfriends. By you. ‘Too much to bear’ This little girl would – in this era - be brought up to believe her mission in life would have been to raise a family. And nothing else. No matter the cost to herself, she must carry this load, balancing it with dignity, poise and sacrifice. 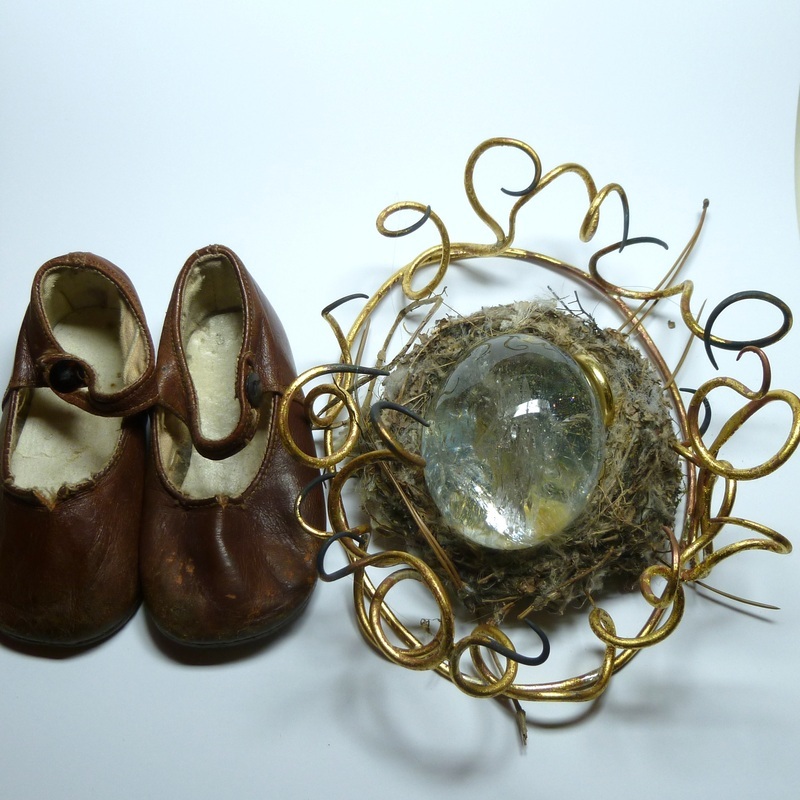 The resin egg – it’s a Cinderella’s-slipper promise of a happy ever after. Like a cuckoo’s egg, it overfills the space available for it, fat-ly comfortable in it’s greedy demand for as much space as it can take. But the tips of each cobra-like spike lie coiled, blackened, poisoned, waiting, ready to strike.